I’m on a mission to tick off the last restaurant on my John Besh list. New Orleans' favourite culinary son has eight outlets in and around New Orleans, most of them reachable by strolling or bike if you live anywhere central. La Provence, though, requires pedestrian old me to enlist a driver for the one-hour drive out to the Northshore. The promise of sunsets wasn’t strictly necessary, but it sweetened the deal as we drove across the Lake Pontchartrain Causeway Bridge, all 24 miles of the world’s longest bridge over water. The Northshore already feels like a different kingdom. In Game of Thrones, it would be where a wealthy tyrant slowly builds his army, ready to storm the lake and overtake the ragtag city dwellers. La Provence would be where this tyrant would probably eat come the weekends. It’s a pretty rustic location, not too many roads apparent on the GPS, and it feels like pulling into a tavern or coaching station. We peak our heads through the wooden door into the low-ceilinged entrance lounge. A tousled young employee noses out from a corridor, eyes us nervously and darts away to inform his elders. A more confident hostess returned, and leads us to the smaller of the two main dining rooms, all low beams, countryside chic, portraits of roosters, that kind of thing. Home made pate is bought out with crostini, again by a youngster who doesn’t really announce anything. The menus are a lesson in prosaic beauty. Nary an adjective that isn’t necessary. The whole thing says: “We’re simple and farm to table and these are the ingredients we do our work with.” In many ways, the lack of flowery textual enticement is MORE appetising. Our server is relaxed and way more chatty and informal than you’d find at any of the other Besh flagship joints. You’re on a farm. It’s rural charm. The familiarity doesn’t obscure her knowledge and enthusiasm, and there’s a team effort in deciding on the food and a suggestion of wine that was just spot on, a Valpolicella that dipped in perfectly between our fish and rabbit entrees. Before any of that happens, the pate scullery boy again comes out with oysters we didn’t order, places them silently on the table and scuttles back. I’m all for gifts from the kitchen, but these moody young silent types need a quick lesson in basic greeting skills. If only so we can says thanks properly. The starters are some lovely green pea and ham ravioli and a quail gumbo where the dirty rice explodes out of the bird. Kind of magic. Mains are the ragout of rabbit and pan fried flounder that swims in a small lake of hollandaise sauce. Executive Chef Eric Loos may be the pastoral satellite, but the food has the class and sophistication of any of its big city siblings. After sorbet and monkey bread that I was reliably informed by my dining companion was “super dank” (A Good Thing), we head out back to see the hidden stars of the show, the pen of Mangalitsa wooly pigs that screech their hellos as we wander up in the dark. They are part of the small farm that provides much of the restaurant’s produce and herbs. Cute as they are, the pigs aren’t named for obvious reasons. The circle of life includes a lot of pork here. 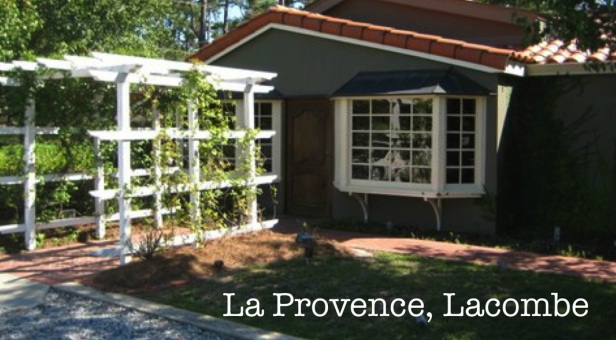 La Provence is where chef Besh started his culinary career. It retains a sense of innocence – unjaded, unpretentiously friendly, genuine. Maybe Chef Besh was once like one of the shy servers, coyly dropping off pate and oysters before shyly rushing away. Maybe one day that kid will have eight restaurants and I’ll be excited to have been to them all. What you're eating: The gumbo is sensational. Whatever they're doing with the pigs from the farm out back.